Why not take advantage of our fantastic lock package deals which we have specifically designed to cater for the most common needs as requested by our customers. They offer fantastic value for money and will ensure your home is safe and secure. SF Locksmith packages can be tailored to you and your individual needs and specifications. Are you moving house, or planning to in the near future? If the answer is yes, then this package is just for you! When the stressful time of moving house arrives, not knowing who else has your new house keys is the last added worry you need. Over half of British residents give away spare sets of house keys or duplicates to various relatives, friends, previous tenants, owners, estate agents and even builders, according to a survey conducted by NOP, on behalf of insurer NIG. To ensure this worry is fully eliminated and reinstate your personal security, we recommend performing a full lock change on all external doors including the garage, if there is one. 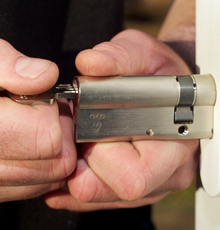 At SF Locksmiths we have a convenient Home Mover Lock Package which offers a complete lock change on all external doors at a discounted rate, giving you the peace of mind you need during your house move. We can even organise this to be completed on the day you move in. If you are worried about your home security, or want to make sure your home is as secure as it can be, this is the package for you! Thieves are increasingly targeting the weak point in the euro cylinder locks fitted to typical property doors, including uPVC, composite and wooden doors. Although the brass lock will help in longevity and resist corrosion, the soft metal narrows in the middle creating a weak point that can be manipulated and thus snapped in half. Through this snapping method thieves can gain unlawful access into your property. The solution... our anti-snap lock package. The current locks on your existing doors can be exchanged for our anti-snap euro cylinders, which feature a preventive defence mechanism to snapping and reinforcement at the cylinder’s weakest point. With other security measures built in, including anti-pick, anti-bump and anti-drill, this fantastic package will give you full peace of mind that your home is protected from unauthorised access. The average house has three euro locks fitted and the cost would be £150 in total. Any additional locks will be £35 each, which we feel is a fantastic price for your future security. Fantastic service and quality, quick, friendly service, would certainly recommend to anyone.